New Paris Saint-German boss Unai Emery has returned to former club Sevilla to sign midfielder Grzegorz Krychowiak for an undisclosed fee. Emery was appointed Laurent Blanc's successor at Parc des Princes at the start of the week after leaving Los Rojiblancos, where he had won three consecutive Europa League titles. The Spaniard moved quickly to finalise a deal for Nice star Hatem Ben Arfa, who joined the Ligue 1 champions when the transfer window opened on Friday, and Krychowiak has now become his second signing for PSG. The Poland international has put pen to paper on a five-year contract with Les Parisiens after helping his country reach the quarter-finals of Euro 2016, where they lost to Portugal on penalties. Krychowiak spent six years in France after graduating from Bordeaux's youth academy, before moving to Spain in 2014 from Reims. The 26-year-old picked up back-to-back Europa League winners' medals under Emery at Estadio Ramon Sanchez Pizjuan and is looking forward to continue working with the Spaniard in the French capital. "I am very proud to return to France and defend the colours of a club as ambitious as Paris Saint-Germain," he told the club's official website. "The opportunity to continue working with Unai Emery was obviously a major factor in my decision. I have joined Paris to live very strong emotions and with the ambition of winning as many trophies as possible. I am looking forward to this exciting next step in my career." 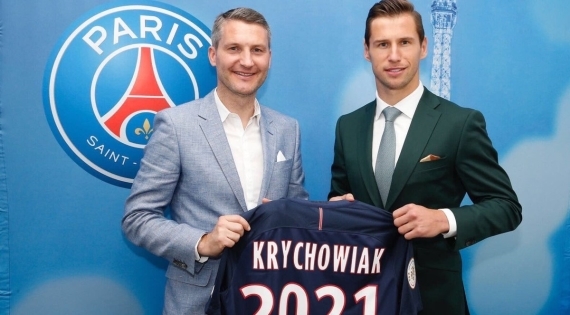 PSG president Nasser Al-Khelaifi added: "Grzegorz represents the values of hard-work and fighting spirit, so important to our club, our fans and our new coach with whom he wanted to continue playing. I have no doubt he will become an important member of our squad."